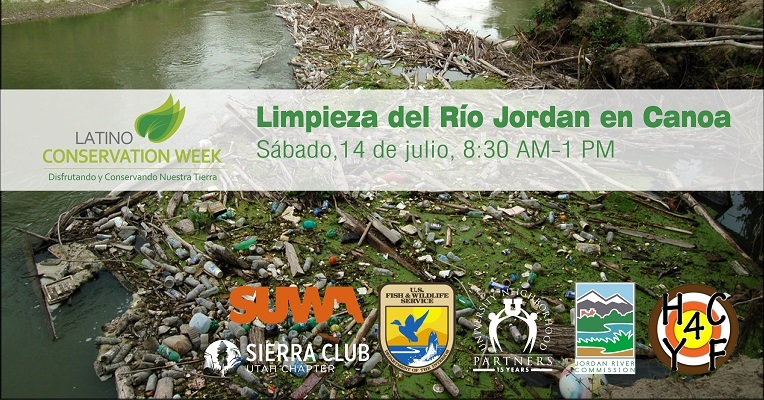 Join Hartland Community 4 Youth and Families and partners from the Jordan River Commission, The Utah Sierra Club, And SUWA for a service outing on the Jordan River in honor of Latino Conservation Week - July 14, 9 AM -1 PM! Take part with the local community coming together to enjoy and protect our Jordan River. 9:00 AM - Embark on the river in canoes and collect trash from the banks! 12:00 PM - Get out of the river at Alzheimers Park, Pizza lunch provided, listen to a talk from the U.S. Fish and Wildlife Service! On Jordan River to north of Seven Peaks waterpark. Questions: For Questions about this event, please contact Olivia Juarez with SUWA at 801-236-3774 or olivia@suwa.org.